x, y, z being the position coordinates and px, py, pz being the corresponding linear momenta. We have discussed earlier that any pair of complementary observables whose operators do not commute cannot be determined simultaneously. Hence from the above commutation relations we find that only one component of the angular momentum can be specified precisely. As per convention, we take this component to be Lz, but we could as well have chosen Lx or Ly. 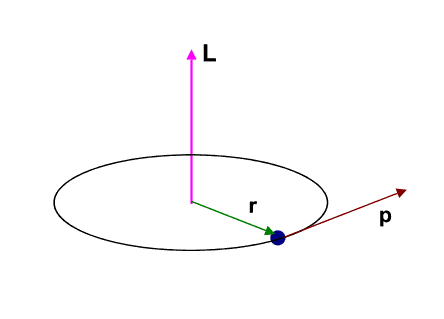 Notice also that L2 commutes with each of the components, hence the magnitude of the angular momentum | | can be specified simultaneously with each of its components. Thus the two fundamental observables are L2 and Lz. The corresponding eigenvalues are j(j + 1) and mj. j can have integer or half-integer values and mj = - j... + j in integral steps. OQ = | | = and OP = Jz = mj . Note that if Jz is specified or fixed we may simultaneously specify only | |. The direction of is arbitrary. 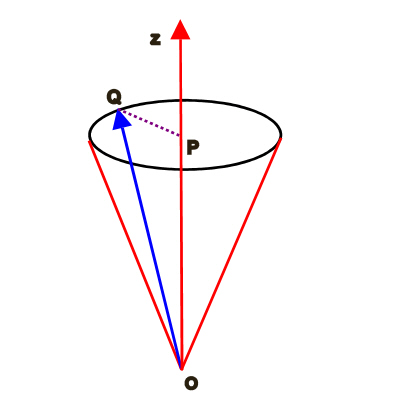 In the vector model of angular momentum shown through the figure above, may be represented by the sides of a cone ( any one among the many shortest lines joining the vertex of the cone to the periphery of the bottom of the cone, but subject to the quantization condition on Jz), the height of the cone being fixed at Jz. In the process Jx and Jy also become arbitrary.